Nervous flyers, who are filled with trepidation at taking to the skies in the run up to the festive season, will welcome the news that British Airways is hosting a Flying with Confidence course at the end the month. The airline's one-day course will take place on November the 29th and has already helped more than 45,000 people conquer their fear of flying over the last 25 years. The course addresses a number of areas that help to take the mystery out of the way a plane operates, drawing on the expertise of the trained pilots and cabin crew who run the course. The course also includes relaxation techniques and other soothing advice from clinical psychologists. “We will be carrying hundreds of thousands of customers visiting their loved ones over the festive period – and we want to make sure every single person has an enjoyable flight. 1. Remember that turbulence is uncomfortable, but not dangerous. Also, keep in mind that it is a perfectly normal part of flying caused by nature. 2. Learn to control your breathing. When you feel anxious, hold your breath, then take a long deep breath in, followed by a long deep breath out – it is a good idea to continue long deep breathing. 3. Combine the deep breath in with a muscle contraction. Clenching your buttocks is most effective, as it overrides other nervous signals going up and down your spinal cord. 4. Aircrafts like to be in the air - they are designed to be in the air. Pilots and cabin crew also like to be in the air; it is a very normal, safe environment for them to be in. 5. Understand the idea of ‘lift’. The wings enable the aircraft to fly, not the engines. A commercial aircraft flying at 30,000 ft can glide for 100 miles even if all of the engines fail. 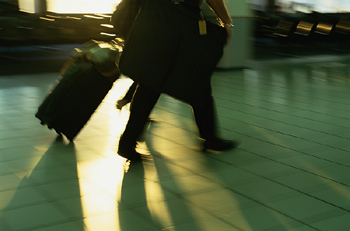 Wherever you are flying to it's important to organise single-trip travel insurance in advance.